Nothing says high energy like a strobe light. They are great for concerts, discos, and Halloween houses. But our strobe is a little different from ordinary strobes. Each of the five rings of LEDs is individually controllable. This allows the Strobe Flash to become a major part of the show, rather than just an accent. This zone control also helps control the amount of light you hit your audience with. Children's performances can be dialed down in intensity by only using 1 or 2 rings of lights for their strobe. You get all of the effect without the risking seizures. This Strobe Flash effect light is also well suited as a stage bang light with 60 watts of bright white light to accent performances or presentations. This strobe light features 120 0.5-watt SMD LEDs, a 0 to 17 Hz strobe rate, and a greater than 400Hz refresh rate, ensuring flicker free operation for television broadcasts and video recordings. It includes a sound activated mode, as well as a built-in programs and 1-, 2-, 4-, 5-, and 10-channel DMX control. It features 32-bit dimming technology for smooth, even fades. This zone control also helps control the amount of light you hit your audience with. Children's performances can be dialed down in intensity by only using 1 or 2 rings of lights for their strobe. You get all of the effect without the risking seizures. 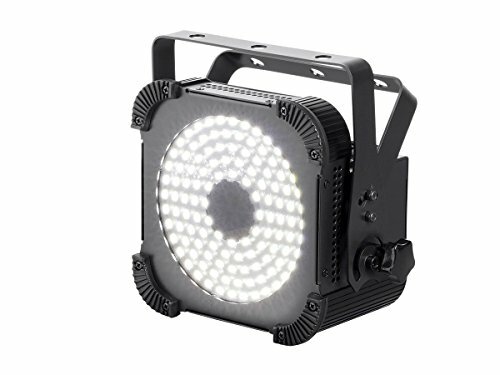 This Strobe Flash effect light is also well suited as a stage bang light with 60 watts of bright white light to accent performances or presentations. Features 120 0.5-watt SMD LEDs, a 0 to 17 Hz strobe rate, and a greater than 400Hz refresh rate, ensuring flicker free operation for television broadcasts and video recordings.